I've read a couple of true history books lately. I especially enjoy narrative nonfiction for learning about history. I have a great memory for the stories--not so great for dates and names. My hope is that reading a whole book about some of these events will stamp the names into my memory, once and for all! In any case, these were both very interesting and brought historical figures to life in memorable ways. 3.5 stars: Life and politics in the early 1800's, plus a murder trial. In 1799, Manhattan was a fledgling city with all kinds of problems. One of the biggest problems was the lack of sanitation and clean water. Yellow fever ravaged the populace nearly every summer, and clean water to drink was simply not available for most people. Yet that was just the status quo back then.The city started a big project to put in pipes that would siphon water from an uncontaminated well, known simply as "Manhattan's Well." 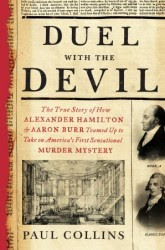 Meanwhile, Aaron Burr and Alexander Hamilton, bitter political rivals, both lived in Manhattan for at least part of the year. They were both top lawyers and often faced each other from opposing sides of the bench in the courtroom. They both hoped to carry the voting in Manhattan for the upcoming presidential election. Burr was behind the clean water project, hoping it would help provide him some badly-needed revenue. One cold winter night, Elma Sands, a Quaker woman living at her sister-in-law's boardinghouse, simply disappeared. Her body was found in the Manhattan Well several days later. It was obvious foul play had been involved. One of the other boarders was promptly accused and taken into custody--an up-and-coming young carpenter named Levi Weeks. The public outcry was swift and outraged. They wanted his blood and nothing less would do! Pamphlets proclaiming his guilt were widely distributed. His fate seemed to be sealed. Meanwhile, Levi's older brother Ezra stepped in to help clear his name. Ezra Weeks was well-off, very well respected, and had connections with many of the leaders of the city. With his money and influence, he managed to hire both Hamilton and Burr to defend his brother. The trial that followed had so much public interest behind it, that a complete copy of the courtroom transcript was published hours after it was over. Collins really brought to life the climate and people of the times. America was still such a young country, and peaceful succession of the president was not at all a sure thing. Add to that the stressors of widespread illness and poverty, and you had disaster brewing. It's hard to believe that Burr and Hamilton agreed to be on the same side of this trial for any reason! Content: Poor Elma's corpse was quite vividly described. For adults. 3 stars: I actually preferred the middle grade version: Chasing Lincoln's Killer. 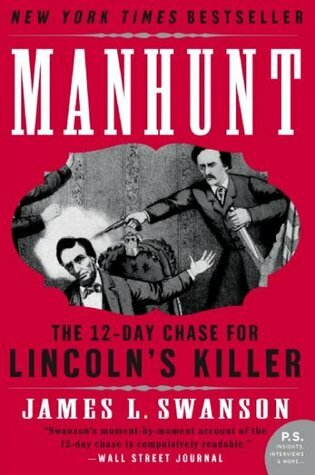 The story of Lincoln's assassination, and how John Wilkes Booth and co-conspirator David Herold escaped justice for 12 days on the run. 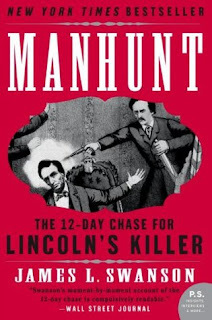 Strangely enough, I thought his depiction of the Seward assassination attempt was more gory in the younger book. Not sure why he made that choice. Even so, my vote would be for the middle grade version. It's much shorter, and what you miss is not of great consequence. Content: The assassination scenes were quite bloody and intense, as was to be expected. For adults. Do you have any more true history suggestions for me? I'm ready for the next!